Alice Metcalf was a devoted mother, loving wife and accomplished scientist who studied grief among elephants. Yet it’s been a decade since she disappeared under mysterious circumstances, leaving behind her small daughter, husband, and the animals to which she devoted her life. All signs point to abandonment – or worse. Still Jenna – now thirteen years old and truly orphaned by a father maddened by grief – steadfastly refuses to believe in her mother’s desertion. So she decides to approach the two people who might still be able to help her find Alice: a disgraced psychic named Serenity Jones, and Virgil Stanhope, the cynical detective who first investigated her mother’s disappearance and the strange, possibly linked death of one of her mother’s coworkers. Together these three lonely souls will discover truths destined to forever change their lives. 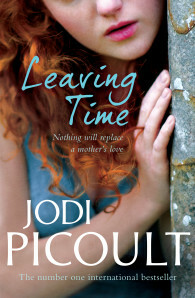 Deeply moving and suspenseful, Leaving Time is a radiant exploration of the enduring love between mothers and daughters.